"This is classic Rhode Island chowder. Only here, we usually use quahogs when making it. This recipe can be substituted either way and turns out great for the clam lover. 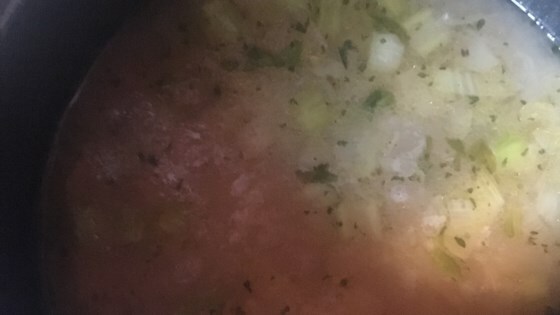 This is a clear soup. This soup should taste slightly spicy, so adjust flavor to your heat preference"
Bring the shucked clams, clam juice, and chicken stock to a simmer in a large pot over medium-high heat. Reduce heat to medium-low and simmer 15 minutes. Meanwhile, melt the butter in a large skillet over medium heat. Stir in the onion and celery; cook and stir until the vegetables are tender. Stir the onion mixture and potatoes into the clams. Season with dill, black pepper, salt, cayenne pepper, and hot pepper sauce. Simmer 15 minutes longer. Sprinkle with parsley to serve.